Ferrero Rondnoir Dark Chocolates the perfect treat for the dark chocolate candy lover. Starting in the middle of these round candy balls you will find a whole almond in the middle of creamy rich dark chocolate all within a wafer shell. They are then rolled in a dark chocolate and almond mixture. These are truly an unique candy and a little piece of heaven for those who love dark chocolate. If dark chocolate is what you are searching for we also have dark chocolate ice cubes each tub has 120 cubes. 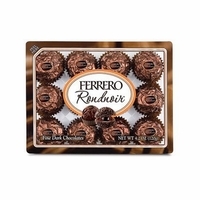 Each box of Ferrero Rondnoir has 12 individually wrapped candies.